My mother is going into her third year in an independent living setting and has just turned 91. She claims that there are all kinds of wonderful stories among her neighbors. In addition to the 23 retired priests (there’s a story there), and a retired ambassador (another), artists, intellectuals, she says everyone has a story, and she proved it by inviting her friend Florence to have lunch with us. Florence is 95, and came to the US from China in a cargo ship in the 1930s. She had a lot of adventures before she arrived (carrying a rifle among them), and a lot more when she settled in the US. Florence taught cooking at the China Institute in New York, and after meeting her, Craig Claiborne (long time food critic of the NY Times) wrote a full page article about her that led to her writing a cookbook about Regional Chinese cooking, long, long before anyone in the US knew there was anything but Cantonese food in China. Jonathan had her cookbook on our kitchen shelf for many years and was thrilled to meet her. Florence is charming and wonderful to talk to. 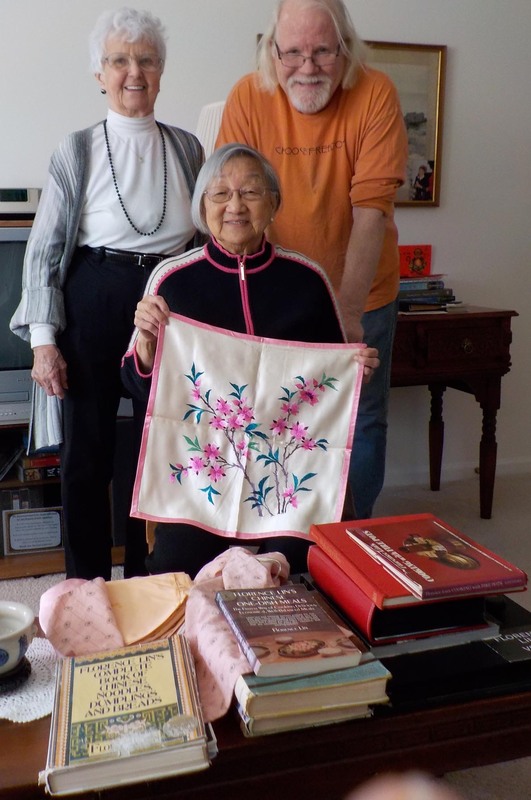 She invited us to her apartment to see her books and she had some beautiful souvenirs of China that she showed us. When she was young, women had to learn to embroider with fine, silk thread to decorate their trousseau. She still has some of the pillow cases she embroidered, and according to my mom, Florence is still skilled with a needle. We had a lively discussion over lunch and our visit. My mom is (once again) right, everyone seems to have a story and don’t let a mild gaze keep you from asking about what people did before they hit age 90. You’ll probably be surprised. I was.